Surface modifications were investigated for an AISI D2 steel after 25 pulses of high current pulsed electron beam (HCPEB) treatment. In particular, X-ray diffraction (XRD) was used to determine the thickness, nature of phase, and texture in the top surface melted layer. The mechanisms responsible for the structure and texture evolutions were further asserted by scanning electron microscopy (SEM) and electron backscattering diffraction (EBSD) results. Under the action of the beam, the large carbides present in the steel were melted and dissolved so that the top surface rapidly solidified as a 3-μm-thick layer of ultra-fine-grained metastable austenite without any martensite formation. The growth of the γ phase led to an unusual <100> + <110> fiber solidification texture. In addition, Σ3-twin boundaries were observed to bridge, most often, near <110> domains. 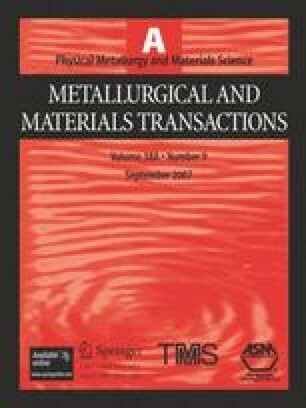 These features, observed here in a Fe supersaturated and highly undercooled melt, are discussed in light of recent findings on atypical growth in directionally solidified Al-based alloys. [40, 41, 42] Comparatively, the α phase present in the heat-affected zone remained randomly oriented. Manuscript submitted September 10, 2005.